July 4 is also the day when Karatbars opened the doors of the very first cryptocurrency bank in the world, KaratCoin Bank (click here to learn about this bank). Coincidentally or not, July 4 is also an American Independence Day. 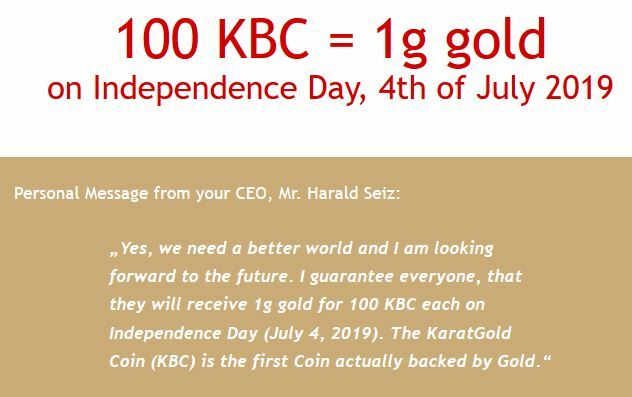 Anyways, starting July 4, 2019, KBC coins can be exchanged for physical gold at the rate of 100 KBC = 1g. Again, KBC or KaratBank coin (also called KaratGold Coin) is the first coin backed up by gold. You can read more about it in the article I wrote this spring. Or go to https://karatgold.io/ to find an abundance of info and videos on KBC.